This Easy Chicken Parmesan Recipe is really delicious with either the restaurant marinara sauce recipe or the garlic cream sauce (Alfredo sauce). Your choice as to what you think you’d like better. The traditional choice is marinara but some people prefer the garlic cream sauce. The restaurant does it as a customer desires. Try one, then try the other when you have a chance. I also use freshly grated Parmesan cheese. It makes a difference. Preparation time: 12-15 minutes (not including the sauce). Serves 4. 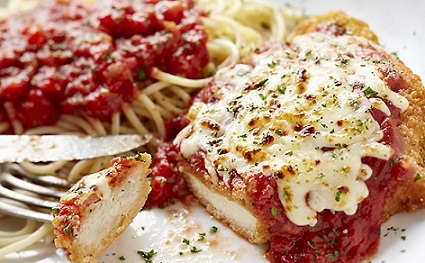 I also serve the restaurant recipe for garlic bread with this easy chicken Parmesan recipe. It’s yummy! 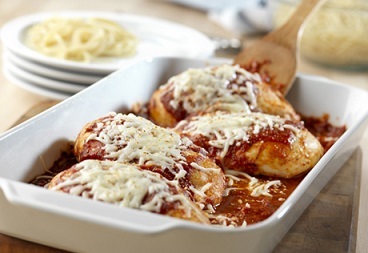 Enjoy your chicken Parmesan recipe and the company of those you share it with. Did you know? 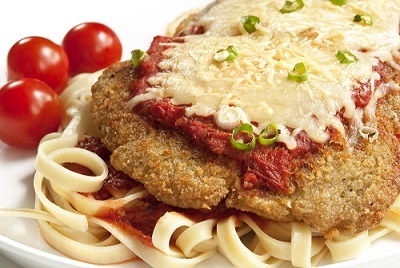 Chicken Parmesan’s origins come from Melanzana alla Parmigiana, or Eggplant Parmesan which originated in one of two places: the northern region of Parma (Parmigiana means “in the style of Parma”) or in southern Italy where eggplants are plentiful.